Motilal Nehru National Institute of Technology (MNNIT) has come up with a new recruitment notification to recruit for Visiting Faculty post through this recruitment notification. This vacancy is match for those who are looking for Faculty Job in Motilal Nehru National Institute of Technology. Who can Apply? The candidates who really completed their Post Graduation study for this post they can apply before last date. Motilal Nehru National Institute of Technology (MNNIT) come to a decision to hire one best candidate who are capable of doing the visiting faculty job. So are you interested or eligible for this job vacancy can apply before this last date 22 July 2016. Motilal Nehru National Institute of Technology (MNNIT) proposes to receive the application from applicants in Offline Mode. Eligibility: The eligible students have to submit the job application to (MNNIT) Motilal Nehru National Institute of Technology earlier the 22 July 2016. Find the below for more information like Age, Eligibility Criteria, Salary, Total Vacancy, Selection Process, Job details, Last date, Application process and other necessary required details for this Job vacancy. Read below all the details carefully before submitting the application online or offline mode. 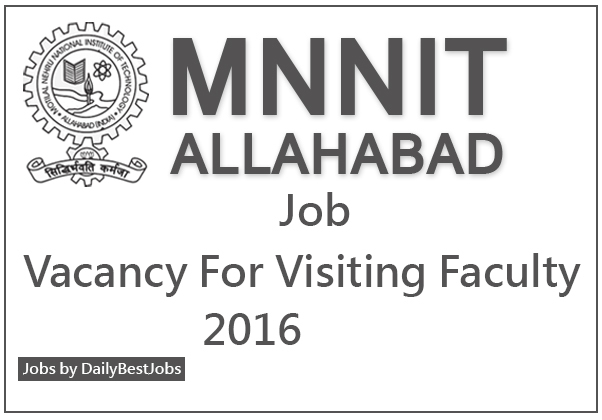 Address for this job: Motilal Nehru National Institute of Technology, Allahabad- 211004, India. Motilal Nehru National Institute of Technology Allahabad, Allahabad (MNNIT) is an Institute having their own records to deal in technology education professionally. In the year 1961, this institute was superbly established as part of their seventeen Regional Engineering Colleges in India as they are jointly enterprise of Government of India and Government of Uttar Pradesh, and not only this it is third oldest university in India associated many colleges of reputed University in Allahabad. To select on time, all interested candidates can apply on or before 22 July 2016. Many job details shared above for the selection process recruitment its very much require all this eligibility to get job perfectly. The interested candidates are requested to fill the prescribed application form and send it to the following address latest by 22-07-2016. Registrar, Motilal Nehru National Institute of Technology Allahabad Allahabad-211004. Last Date to Apply for this job 22 July 2016. We wish you all the very best to the candidates who will apply for this job vacancy and will provide more daily best jobs vacancies and notifications. Stay tuned here for the more Latest dailybestjobs.